OCEANFRONT@ SANTA CRUZ BEACH *Complete Privacy * Backyard, Beach, Views, DOG OK! Oceanfront House At Beach, 3 Bedrooms + Sofabed, 2 Baths, (Sleeps 6+). Dog OK. 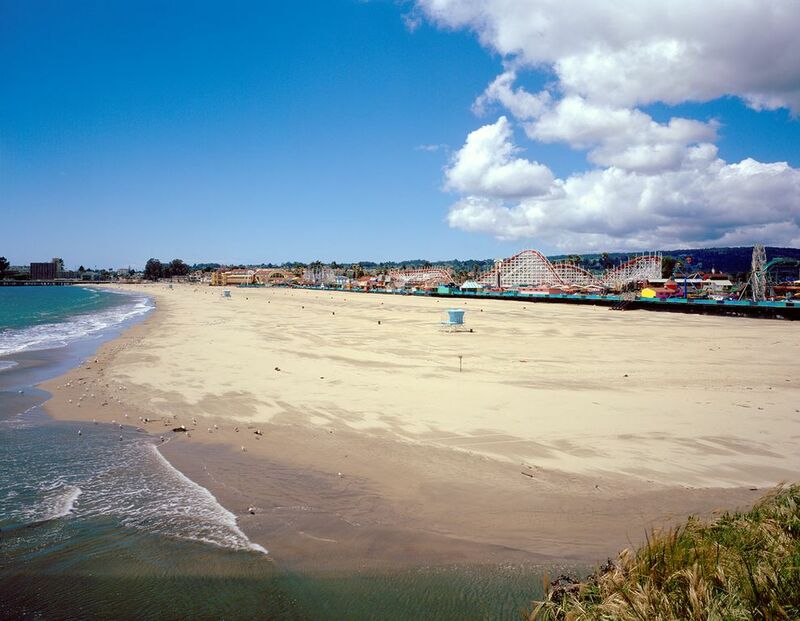 Spacious 3 Bedroom - 2 Bathroom house fronts the beach in Santa Cruz, California. Prime location along majestic West Cliff Drive. This single family home at the beach boasts an ocean front patio and old brick deck, enclosed backyard, 3 spacious bedrooms, gourmet kitchen with breakfast area, large living and dining rooms, 2 fireplaces, 2 car garage, 4 Flat Panel TV's with HDTV and Enhanced Cable, DVD's, High Speed Cable Internet, table tennis, and beach toys. Very spacious, comfortable, clean, private, and relaxing. Sleeps 1-6 (+). Dog friendly. Portable Air Condition unit (see information below). THIS IS ONE OF VERY FEW OCEANFRONT HOMES WITH A FULLY ENCLOSED BACKYARD. PERFECT FOR COUPLES OR FAMILIES. BEACH, TIDE POOLS, AND PAVED OCEAN PATHWAY THAT EXTENDS FROM NATURAL BRIDGES TO SANTA CRUZ PIER & BOARDWALK IN FRONT! FOR KIDS AND THE FAMILY DOG, A PARK WITH PLAYGROUND, SKATEBOARD PARK, TENNIS COURTS, AND FIELDS JUST DOWN THE ROAD FROM THIS BEACH HOUSE. **Oceanfront @ Beach** Complete Oceanfront Privacy! Ocean Front Living room boasts fantastic views of Santa Cruz and the Monterey Bay. Watch dolphins, sea otters, and other marine life from the living room, covered porch, or the front patio. At night, see the lights of Monterey, Moss Landing, and Pacific Grove glitter across the Bay. Living room is equipped with quality leather furnishings, fireplace, 42' flat panel HDTV, VCR, DVD player, stereo with CD player, and high-speed cable internet access (WiFi). Brick patio offers an outstanding place to relax in the front yard. Enjoy the view from majestic West Cliff Drive. Sit in the sunshine, or under the covered porch. Private beach with tide pools to the left. Extraordinary Ocean Views. In the evening, guests have use of a self-contained fire pit. 3-mile Ocean pathway connects Natural Bridges State Beach and Park to the Santa Cruz Beach Boardwalk. Call for our list of local activities, and also kids activities. Complete and modern kitchen equipped with all the amenities any chef would expect: Coffee maker, Grinder, Food processor, Juicer, Bread Machine, and Microwave, KitchenAid Cookware. Newly remodeled kitchen includes granite counter tops, stainless sinks, newer fixtures and updated appliances. Guests in the main dining room can view yard and patio while taking advantage of spectacular ocean scenery. Dining area provides seating for four to six guests, formal & casual dishes, table coverings & accessories. Enclosed backyard offers a spacious, comfortable place for gathering, in a private outdoor setting. Large sliding glass windows deliver great ocean views from a backyard setting! A perfect place to meet for lunch, or enjoy dinner, after a day at the beach. Barbecue and accessories provided. Additional patio furnishings and table-tennis equipment stored in garage. This bedroom abounds with beautiful Ocean Views, and soothing sounds of waves crashing along the Coast. 32' Flat Panel HDTV with enhanced cable. Monterey Cypress adds to the splendor of this perfect retreat. Deluxe pillow-top California King mattress, large walk-in closet and hardwood floors. Located to the front of the house, this bedroom offers privacy in a comfortable and scenic setting. The enclosed brick patio is just a step away from this quiet bedroom. With morning shade and afternoon sunshine, this bedroom offers the perfect ingredients for restful sleep. 32' Flat Panel HDTV with enhanced cable. Deluxe pillow-top California King mattress, walk-in closet, access to enclosed backyard and patio. This Large Bedroom has ocean views and access to back patio with a fireplace inside the bedroom and attached bathroom. 32' Flat Panel HDTV with enhanced cable. Deluxe California King mattress. There is a full-sized leather sofa bed available to guests. Our guests have use of high-speed cable (wireless) Internet connection. Advance notice of desire to use required. We have a portable unit that requires some installation. Please note: This is NOT a central A/C unit, and it is does NOT serve/cool the entire house. It's best used to cool one bedroom. Occasionally guests may ask to bring along their dog. Santa Cruz is friendly to people and dogs. You may be permitted to bring your dog if you agree to the rules established to maintain the quality of cleanliness for everyone seeking to enjoy this beach house. Available year-round. 2-night minimum stay in low season with preference for longer stays. Monthly rates from $10k/month in low season. Fully Refundable security by check or credit card required. No parties or gatherings permitted. Occupancy is 1-6 people (8 if small children).Owner meets guests at house for check-in at 3PM or by written agreement. We enjoy hosting couples and families at this house. When you book, please share your interests so we can create a customized arrival package for you. Many of our guests are families with two or three generations traveling together, and others are just couples. We've met so many wonderful people over the years, and are happy to share this special home with others. We look forward to hosting your stay at this oceanfront home at the beach in Santa Cruz! We like the west side of Santa Cruz - it's friendly to people and dogs, with easily accessible beaches, coastal sidewalk, and forever views. We especially like the feeling of being on the ocean, the gentle breezes, and ocean sounds - especially during the wintertime. Storms can be magical at the coast. Fall is also a wonderful experience with less morning fog and sun early in the day. We enjoy watching people walk their dogs, ride bikes, roller skate, jog, and skateboard along West Cliff Drive. The ocean views from the living room, kitchen, dining room, breakfast area, and even the backyard are wonderful. We also enjoy strolling along the paved ocean walkway to the Lighthouse Surfing Museum to watch the surfers, and beyond to enjoy the Santa Cruz Pier and Beach Boardwalk. This beach house is centrally located, and is great for people of all ages. Advance notice of desire to use required. We have a portable unit that requires some installation. Please note: This is NOT central A/C, and it is does NOT serve/cool the entire house. 1 bedroom max. 2 WOOD BURNING FIREPLACES. WOOD PROVIDED. 2 car garage. Extra patio furnishings. Wood for fireplaces. Beach chairs. 2 BRICK PATIOS WITH OCEAN VIEWS! OCEANFRONT AT BEACH HOUSE: 4 Flat Panel HDTV's w/enhanced cable in each bedroom, enclosed backyard, 2 Fireplaces, Phones, Premium Cable TV, WiFi, Dog Allowed with prior permission & rules, Fully Equipped Kitchen, Charcoal + Gas BBQ, cable high speed Internet access, Family Board Games, and much more. Please note: Fully Refundable security by check or credit card required. No parties or gatherings permitted. Owner meets guests for check-in at 3pm or by written agreement. OCEANFRONT: Beach in front of house, dog friendly accommodation, Natural Bridges beach and State Park, Lighthouse Surfing Museum, Walking along paved ocean walkway from Natural Bridges to Santa Cruz Beach Boardwalk and Pier, Walk, Jog, Stroll, or Skate along majestic West Cliff Drive. Table Tennis located inside garage.